After leaving the CASUALTY’s ED department six weeks ago, how is Fletch’s arrival on AAU explained? AAU gets really busy and Raf asks Colette for more nurses or at least a ward manager to help out. What Colette doesn’t know is that Guy has already intervened and gone behind her back and hired Fletch, who has transferred up from the ED, as the new ward manager. For you personally, how did the opportunity to swap shows and join HOLBY CITY come about? Whilst I loved working on CASUALTY I did miss my family as when I was filming in Cardiff they’d stay in Kent. I wasn’t sure I could do the commute for much longer so I mentioned this to the producers and they came up with an idea that meant Fletch would transfer from CASUALTY to HOLBY. I loved the idea and I’m really grateful to them for finding a way to keep my character at the hospital. 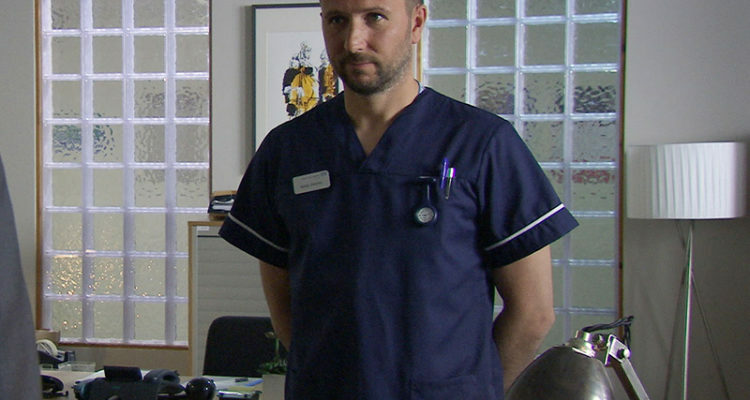 Joining HOLBY, we learn Fletch has some past history with Colette, what can you tell us about that? Fletch and Colette go way back and they do have history together and there are some unanswered questions floating about. Also they haven’t seen each other for years, so to be suddenly working together will be a little awkward for them. Whilst it’s a bit of a shock at first they have to put their differences aside and concentrate on the patients – Fletch has been warned by Guy and Ric so he’s just trying to keep his nose clean and do a good job ….. For now! How does he get on with the rest of his colleagues? When Fletch arrives he gets a bit of an earful from Ric. Ric knows Tess and doesn’t want that kind of behaviour on his wards. But Fletch is such a likeable character I think he’ll get on well with his colleagues as he likes to have a laugh and people warm to him, him and Raf will become friends and work well as a team. Since splitting from his wife and his affair with Tess, will there be an opportunity for Fletch to have any potential new love interests? Back in CASUALTY, Fletch was also spiralling into a gambling addiction, will this storyline continue into HOLBY? I think Fletch transferring from ED and getting this promotion is a chance for him to make a fresh start. So I think at the moment his focus is on work and proving that he’s learnt from the past so fingers crossed he’s managed to get the gambling under control so it doesn’t affect his new job at Holby. 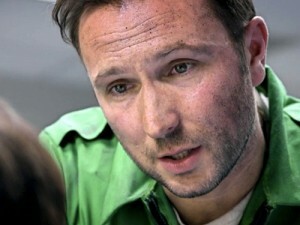 You had a fantastic exit storyline in CASUALTY, what feedback from viewers did you get? I got loads of really positive feedback from fans. Some thought that Tess and Fletch could’ve worked it out and some were really sad to see Fletch go. But the majority of fans really enjoyed the conclusion. Did you enjoy filming those scenes? I had a brilliant time filming the scenes. The stunts were so much fun to do plus filming the emotional scenes with Suzanne I found quite easy to do as she’s such a great actress. How does HOLBY compare to working on CASUALTY? There’s less blood squirting in your face in Holby! What have the HOLBY cast been like to work with? The cast are really lovely and everybody’s been so welcoming. I knew Rosie Marcel from when we worked together on The Bill and I’d met Chizzy and Louise a couple of times but other than that I didn’t really know anyone else. But all the team are so supportive and really nice it’s made the transition really smooth. Do you miss working with the CASUALTY cast? I had a great time in Wales and everyone I worked with on CASUALTY was superb it’s a really nice place to work and I’ll definitely miss working with everyone. No Comments on "Alex Walkinshaw Interview"